When I saw the title of O'Dell's book, I knew I wanted to read it. 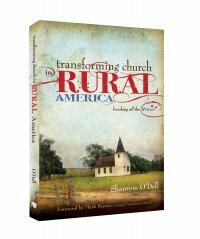 Sean and I, as you know, are lovers of rural, country life and having several dear friends over the years who have pastored small churches, I could not resist the opportunity from Thomas Nelson to review this book. It did not disappoint. This book is an easy and inspiring read, bringing up the albatross in the room that our mega church minded culture is trying to step over -what about the small town, rural churches? Who will shepherd those flocks? And how do pastors called to the rurals bring about healthy change that brings growth? What a great topic, and such a huge need! Thanks for letting us know about the book. Oh, how I would love to read this book. I live in a rural area where there are well over 20 churches. Zero of these churches work together to meet the needs of our community. I recently left a church that my family had been at for 9 years (working in children's ministry) because of the lack of integrity of the leadership of the church. It has been difficult to find the right home church since then. God has a perfect plan. This sounds like a great book. I'll have to try to get my hands on a copy.